Until that time when Han In Carbonite Popsicle Mold becomes a reality in our freezers, his ship will have to do. You don’t have to travel to a galaxy far, far away to get your hands your very own Kotobukiya Star Wars Millennium Falcon Silicone Ice Tray . And if you really have your heart set on a frozen Han popsicle treat, the company does offer the Kotobukiya Star Wars: Han Solo in Carbonite Silicon Tray , as well as general-use molds for R2-D2, Darth Vader, Storm Troopers and X-wing fighters. Yikes! That’s a lot of cold Star Wars! From a galaxy far, far away this Kotobukiya silicon Millennium Falcon ice tray comes blasting in from Hyperspace. Create Ice, Jello, Chocolate, cookies, etc in the shape of the Millennium Falcon. 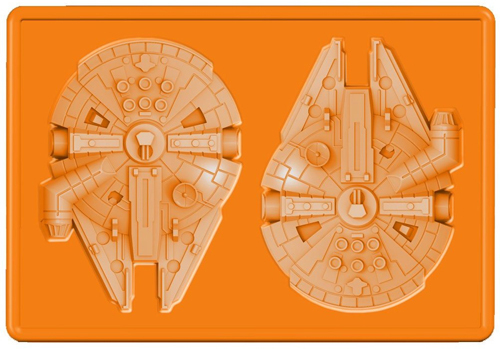 The Millenium Falcon silicone ice tray is heat (230 celcius or 446F) and cold resistant, as well as oven and microwave safe! Great for baking or freezing. Add some fun to your parties with Star Wars ice cubes and treats!